Guatemala City (Ciudad de Guatemala) is the capital and largest city in Guatemala. Locally, it is often referred to simply as Guate. It is the governmental, financial and cultural epicentre of Guatemala and also an important logistic hub. At the 2017 census, the metropolitan area was home to 3.3 million people. Guatemala City is nestled in a mountain valley named Valle de la Ermita, in the south-central part of the country. In pre-columbian times, the Maya built a city named Kaminaljuyu here. The Spanish established a colonial-style town, and turned it into the capital when Antigua Guatemala (then known as Santiago de los Caballeros) was severely damaged in an earthquake in the 1770s. The new capital was given the name Nueva Guatemala de la Asunción (New Guatemala of the Assumption), and Our Lady of the Assumption became its patron saint. The old capital is today known as Antigua Guatemala and is a popular tourist destination. Guatemala City is divided into 22 zones and learning the basics of this system will make it much easier for you to navigate the city. The zones are numbered 1-25, but zone 20, 22 and 23 doesn’t exist. The zones are assigned in a spiral form starting in the historic centre – Zona 1. 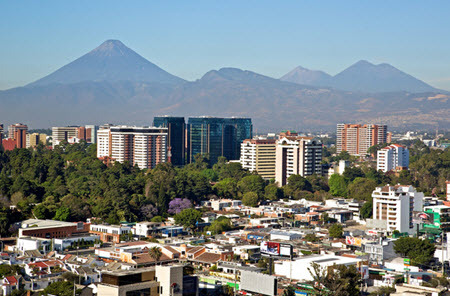 Guatemala City has a tropical savanna climate, bordering on subtropical highland climate. The high altitude makes the city considerably cooler than Guatemala’s lowland cities near the coast. The average temperature is usually within the 22-28 degrees C span during the day and 12-17 degrees C during the night. The rainy season extends from May to October, with the warmest part of the year being right before the onset of the rainy season. Zona Uno (Zone 1) is the historic centre of Guatemala City and you will find a lot of notable buildings here, including Palacio Nacional de la Cultura (National Palace of Culture), Catedral Metropolitana, Casa Presidencial, Biblioteca Nacional, Teatro Abril, and Hogar Rafael Ayau. This is also were La Sexta Boulevard and Plaza de la Constitución are located. Named after its vibrant night-life, Zona Viva (“the lively zone”) is located within zone 10 in Guatemala City and bordered by Avenida La Reforma and Bulevar de Los Próceres. Zona Viva has plenty of bars, nightclubs, discos and restaurants. One example of a popular restaurant here is Kacao, where the waiters were traditional Mayan costumes and serve traditional Guatemalan food. Tips! Calzada Roosevelt in zone 11 also offers a great night-life. Kaminaljuyu was occupied by the Maya civilization from 1500 BC to 1200 AD. Today, only a few mounds remain. As late as the 1930, there was still some 200 platforms and pyramidal mounds here. The largest stadium in Guatemala is Estadio Nacional Mateo Flores in Guatemala City, with a capacity of 26,000 seats. It was built in 1948 to host the Central American and Caribbean Games in 1950. The stadium is located in Zone 5. Games are usually played on Sunday mornings/afternoons. The most expensive among the standard tickets are called Palco, followed by Preferencia. Tribuna are for the die-hard fans and General Sur y Norte are the cheapest tickets. Football (association football / soccer) is a very popular sport in Guatemala and Guatemala City is home to several football clubs, with CSD Municipal (“Los Rojos”), Aurora FC and Comunicaciones (“Los Cremas”) being the main ones. Los Rojos and Los Cremas both have Estadio Nacional Mateo Flores as their home venue. The Ixchel Museum of Traditional Costumes holds a large collection of traditional Guatemalan costumes and information on their history and cultural significance. There are also exhibitions on weaving and dying techniques, how the materials are processed, and more. Informational texts are available in both Spanish and English. The gift shop sells high-quality artisan products. The museum is located at the campus of Universidad Francisco Marroquín in Zona 10. Museo Popol Vuh holds some of the world’s most significant collections of Maya art. This includes funerary ceramic art, portable stone sculptures, and more. The exhibits are organized chronologically within the museum, starting with the Paleoindian era and ending with the Colonial era. Just like the Ixchel Museum, Museo Popol Vuh is located at the campus of Universidad Francisco Marroquín in Zona 10. Guatemala’s main international airport – La Aurora International Airport (IATA: GUA, ICAO: MGGT) – is located in Zona 13 of Guatemala City. The distance between the city centre and the airport is approximately 6.5 km. Examples of large U.S. airlines that traffic this airport are American Airlines, United Airlines and Delta. Spirit Airlines is a U.S. low-cost airline with flights directly to Ft Lauderdale, Florida, USA. Spanish carrier Iberia has a direct flight to Europe (Madrid) three times a week. Examples of airlines with flights from La Aurora to other parts of Central America (and in some cases also northern South America) are Aeromexico, TAG, Avianca, CM, Copa, Tropic Air, Interjet, and Sosa. In addition to the many international routes, this airport is also from where you can fly out to Flores in Peten with TAG, Tropic Air or Avianca. Many long-distance bus companies stop in Guatemala City. Some are international while others only offer transport within Guatemala. There is no main terminal for all long-distance buses; instead each company has their own. Most of these terminals are located in Zona 1, and the area south of Plaza Barrios is especially popular. After dark, this terminal area tends to be a bit sketchy, so use caution and travel by taxi not foot. It is also worth mentioning that some hotels in Guatemala City doubles as bus terminals so you can wait in your hotel room and board the bus directly from the hotel lobby, completely voiding the need for having to hang out in the terminal area in Zona 1. TicaBus operates a bus route that goes all the way from Mexico through Guatemala, Honduras, El Salvador, Nicaragua, Costa Rica and Panama (and then back again the same route). TicaBus have a hotel (Hotel Santiago) integrated in their bus terminal in Guatemala City. The hotel is no-frills, but clean and safe. At the time of writing, a single room with fan and private bathroom costs 25 USD/night. Buses to Guatemala City from Managua (Nicaragua) and San Salvador (El Salvador). Has a ticket desk inside Hotel Crowne Plaza in Guatemala City. Very wide network within Guatemala, and also have buses coming from San Salvador (in El Salvador), San Pedro Sula (in Honduras), Belize City (in Belize) and Tecun Uman (a Mexico-Guatemala border crossing). Buses to Guatemala City from Tapachula (at the Mexico-Guatemala border) and Belize City (in Belize). Also domestic buses to Guatemala City from Huehuetenango, Quetzaltenango, Peten (Sta Elena), and Rio Dulce. One route goes from the Mexico-Guatemala border town of Tapachula via Rethaluleu & Coatepeque to Guatemala City, while another route goes from San Salvador (in El Salvador) to Guatemala City. Direct bus from San Salvador (in El Salvador) to Guatemala City. Comfortable buses to Guatemala City from San Pedro Sula, La Ceiba, Copan Ruinas and Tegucigalpa/Comayaguela in Honduras. Also services the domestic route Guatemala City – Antigua Guatemala (but in vans, not in full-sized buses). Buses to Guatemala City from San Salvador (El Salvador) and Tegucigalpa (Honduras). Has a ticket desk inside Holiday Inn Hotel in Guatemala City. Buses from San Pedro Sula (Honduras) to Guatemala City. Also plenty of domestic routes within Guatemala, especially between Guatemala City and the eastern parts of the country. Autobuses del Norte (ADN) Comparatively comfortable buses to Guatemala City from Flores (Petén), Coban & Quetzaltenango. Litegua Buses to Guatemala City from the eastern parts of the country, e.g. Puerto Barrios, Chiquimula, Morales, El Florido (near Copan), El Rancho and Jocotan. There is no regular passenger or cargo traffic on Guatemala’s railroads anymore. Sometimes, chartered tourist trains use what remains of the old 914 mm narrow gauge system.